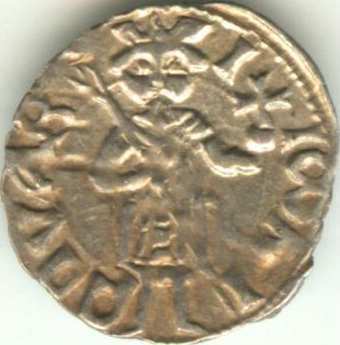 This medieval coin appears on the site through the kind permission of an anonymous donor. This silver coin was issued by Mircea the Old (cel Bătrîn), the most glorious and important of all Walachian princes. He ruled Walachia between 1386 and 1418. On this coin Mircea is depicted in the style of the Byzantine coins. 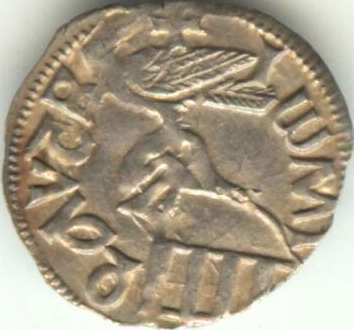 As a type this coin is known to Romanian numismatics as Walachian ducat, as complying to the system of Venetian ducats struck in 1202 by Venice. The legends on the coinage of Mircea the Old were written both in Latin and Cyrillic (Slavic). This one uses Cyrillic. There are plenty of different variants in which concerns the legend, its respective fonts, the mint ensigns (usually both on the obverse and reverse, but different) and of course misspellings. The Bible of Romanian numismatics, Monede şi bancnote româneşti by George Buzdugan, Octavian Luchian and Constantin Oprescu (1976), presents this coin type at numbers 206 and 207. If you are in possession of Romanian medieval coinage other or better than the one featured by our site we ask you to please aid us with pictures. Help from other collectors to complete this numismatic icon is more than needed. Do not hesitate to contact us. The orb, also known as imperial apple or crucifer globe, is a symbol of the monarchal power, being a sphere of noble metal adorned with precious stones, surmounted by a cross. The cross above the globe symbolize the universe ruled by the Cristianity.